These Wire Spinners are Designed for Countertop Applications! There is Also a Large Collection of Floor-Standing Models for Sale as Well! Purchase Wire Spinners that Ship Fast Online Today! These wire spinners are designed to be positioned on countertop surfaces. As a result, customers will instantly notice the various publications. 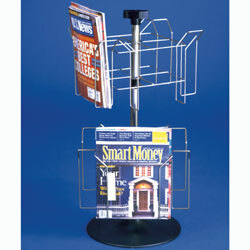 The wire spinners are ideal for displaying the most popular magazines in any store. Each rack measures 16" in diameter. The small footprint of the wire spinners is perfect for companies with limited space. The rotatable design makes it easy for customers to access merchandise. These wire spinners are perfect for showcasing a lot of literature in a small amount of space. Each has (8) pockets, which are designed to accommodate 8-1/2" wide x 11" high periodicals. The wire spinner racks use their 2" deep slots to display several magazines. The literature holders have (2) independently rotating tiers, each with (4) pockets to support all kinds of printed materials. The wire spinners also include a sign holder that will fit headers up to 1/8" thick. 8.8" x 8.0" x 2.0"